North America is one of two continents named after the Italian explorer Amerigo Vespucci, with a surface area of 24,221,490km² (9,351,969 square miles). It's in the northern hemisphere, between the Pacific Ocean and the Atlantic Ocean and to the north of South America. North America's highest point is Alaska's Denali, which rises to 6,194m (20,320 ft) above sea level. North America consists of three large nations and one large island territory that covers most of its area. They are Canada, the United States of America (USA), Mexico and Greenland. There are also seven smaller nations at its southern extreme (collectively known as Central America), around two dozen island nations and territories of various sizes in the Caribbean, and one isolated French territory (Saint-Pierre and Miquelon) off the Canadian Atlantic coast. 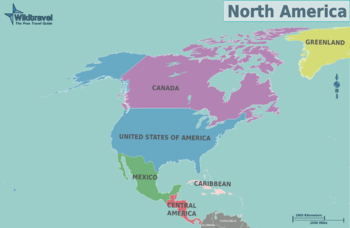 Although the Central American and the Caribbean regions are technically part of the North American continent, they are commonly listed separately from their larger neighbours to the north and hence the distinctive region names for both cultural and geographical reasons. Canada certainly has vast expanses of breathtaking, unspoiled wilderness, but it also features some of the world's most modern, cosmopolitan cities. From the majestic Pacific coast to the laid back beauty of the Atlantic coast, more than 5,000 KM, Canada has something for everyone. White sandy beaches, crystal-clear water, and laid-back island culture make the Caribbean one of the world's top vacation spots. The seven small nations of this isthmus connecting North and South America blend elements of both continents; you'll find bustling cities, long coastlines, ancient jungle ruins, and Spanish-tinged mestizo and Afro-Indian cultures. A self-governing country, but officially still part of Denmark, Greenland is a vast island of stark landscapes and midnight sun. Mexico is a big tourist attraction for sun-seekers and historians alike; the former flock to Mexico's tropical beaches, while the latter find the artifacts of the ancient Aztec and Mayan civilization fascinating. One of the largest, most ethnically diverse and multicultural nations on Earth includes some of the world's most famous cities, natural parks of unspeakable beauty, and virtually everything in between. Chicago – the third most populous city in the United States, the 'Windy City' is the home of the skyscraper and blues music. Havana – the capital of Cuba is famous for its cigars, its strong Hispanic-Caribbean culture, and its legendary nightlife. Kingston – a hub of Afro-Caribbean culture, it is cosmopolitan, diverse and the Home of Reggae. Los Angeles – Hollywood and movie stars; mountains and beaches; and lots of traffic. Mexico City – the third-largest city in the world is chock-full of museums, centuries-old architecture, modern amenities... and people. Montréal – the Paris of Canada; Canada's second-largest city and the bilingual cultural and economic capital of the province of Québec. Panama City – a friendly city sitting at the nexus between two continents. Toronto – Canada's largest city, a cosmopolitan mosaic with soaring skyscrapers nestled over the beautiful Lake Ontario. Vancouver – a city of steel and glass condominiums and outstanding natural beauty, where you can go skiing and sit on the beach all in the same day. Washington, D.C. – the capital of the United States, with cultural and historical attractions aplenty. Prior to Christopher Columbus establishing trans-Atlantic contact in 1492, the Americas were inhabited by a vast array of indigenous peoples. While at a lower technology level than Europe, they had large populations and developed trade networks. However, contact brought a vast array of Eurasian diseases to the locals, which proceeded to cause probably the largest mass death in human history (estimates range as high as 200 million). While this was largely unintentional, it shattered the local powers and left the continent open to Europeans. Colonization and conquest quickly followed, as Europe sent adventurous souls across the ocean to the "New World". Natives were still important military powers until the 19th century, but as Europeans marched west, they rapidly became allies and subjects instead of independent powers. The last independent tribes were conquered in the 1870s, though occasional rebellions happened later. European conquest was primarily English, French, and Spanish, though the Dutch, Danish, and Russians controlled some territory as well. Originally, it was small outposts to produce valuable crops like gold, cotton, tobacco, fur, and sugar, but over time as the settler population grew, farming and logging grew to become more important, particularly in the English and French areas. The French lost the vast majority of their territory in the Seven Years War (1756-63), but the economic cost of that war, among other causes, led much of the British areas to rebel in 1776 and eventually form the United States of America. Rapid decolonization followed in the 19th century, either by rebellion (as in cases like Haiti and Mexico), or by peaceful agreement (as in cases like Canada). North America has seen relatively few wars in the European period. In addition to various rebellions and civil wars around the continent, the Americans fought the British in 1812, the Mexicans in 1848, and the Spanish in 1898. As such, there is very little of the sort of military ruins that dot Europe and the Mediterranean basin, and North Americans have little of the history of strife that the rest of the world does. Conversely, North America has a much more relevant history of slavery than most other places, with millions of primarily-African slaves being forcibly taken there to work in mines and plantations from the 16th-19th centuries. The legacy of this has faded over time, but is still a relevant political issue, primarily in the United States. North America is primarily populated today by immigrants and their descendants - indigenous peoples are less than 10% of the population. The United States and Canada in particular are nations of immigrants, with waves of people from all over the world moving there over the last few centuries. As such, they are the most multicultural places in the world, particularly in larger cities like New York and Toronto. Virtually all travel into North America is by air. Every major city has an international airport with service to other continents, and they are generally safe and feature reasonable amenities. However, travelling through security is almost universally considered annoying, particularly in the United States, with many restrictions that seem almost arbitrary to the average traveller - removing your shoes, intrusive full-body scanners, limitations on fluid containers, and the like are nearly universal in the US, and some are common elsewhere. It is also technically possible to enter North America by ship, though very few transoceanic liners still exist in this century, or overland through Panama, though this route is extremely rough and dangerous. European visitors should note that crossing international borders is not as easy in North America as they may be used to in the Schengen area. Borders are not generally difficult to cross, although queues of an hour or two to clear customs at peak hours are not unheard of. Expect a guard to ask you several questions (citizenship, where you're going, how long you'll be there, etc.) - answer clearly and calmly, and you will more often than not be let through without incident. However, guards can ask more questions or do a more thorough search at will, and will do so for travellers who seem suspicious, particularly when crossing from Mexico into the United States. As well, some foreign tourists from geographically smaller countries are surprised by the sheer scale of North America. A trans-continental journey by car or train can easily take a full week, and is impossible to do in less than 2-3 days. If you are planning to visit multiple different areas, keep this in mind, and if in doubt check Google Maps to confirm that your itinerary is possible. Because population centre are often widely spaced, most long-range travel is by air, with an extensive network of major hubs and smaller regional airports, usually supplemented with car rental services to cover local travel (see "By car"). Expect to pay at least $150-200 per flight, even when booked well in advance. There is prolific long range bus service across most of the US, Canada and Mexico, but travel times are excessively long (as much as three to five times as long as a direct trip in a personal vehicle for shorter routes) especially while travelling on the Greyhound Network. However Megabus has been making inroads in North America and now offer a few non-stop options between major cities, with modern double decker buses equipped with Wi-Fi. In Mexico, most Primera, Plus or Executive buses, are modern, clean and will run non-stop to your final destination. The Executive ones, have airplane business like seats with an almost full flat recline, Wi-Fi, Individual TV and with a small meal and drink provided and recently man and women restrooms. Most travel in Canada, the United States, and Mexico is by personal vehicle. Almost all highways in Canada, the United States and toll roads in Mexico are well maintained, with amenities such as gas, food, and lodging ranging from adequate to very convenient to excessive. If you experience an emergency that endangers your life, safety, or property, you will be able to dial 911 from a compatible cell phone on almost any major highway and reach an operator at any time. Vehicle and medical insurance issued in either Canada or the US is usually valid in the other, though the wise traveller will confirm with their insurer. Canada and US insurance coverage in Mexico is sometimes limited or not honoured. Again, the wise traveller will confirm with their insurer. Car rental agencies are available at almost every airport. Usually a major credit card and proof of liability insurance is required. Some agencies offer short term insurance and additional coverage. The United States and the majority of Canada are majority English speaking countries and is by far the best language for getting around these vast countries. English is also spoken in many Caribbean nations and the small country of Belize. Mexico, most of Central America, some southern cities of the United States and portions of the Caribbean are majority Spanish speaking, making it the second most spoken language in North America. French plays a substantial role in Canada, (particularly in Quebec, where it is generally dominant and often universal, but it is relevant in parts of Ontario, Manitoba, and New Brunswick), as well as in some parts of the Caribbean. Dutch is spoken in the southern Caribbean. Several indigenous languages are spoken by Native Americans and the Inuit peoples of North America including in Greenland, Alaska and Nunavut, though communities where they are the primary language are extremely rare and remote. Danish is also spoken in Greenland. Other important immigrant languages spoken in many ethnic neighborhoods of North America are Cantonese, Mandarin, and Tagalog. German is still spoken in rural communities of the Amish. Knowledge of English, Spanish, and French will be sufficient for virtually anywhere in North America. Basically any activity imaginable is possible in North America. Major cities have a wide variety of attractions, including museums, amusement parks, concerts, and sporting events. Smaller cities and towns generally have at least a few things to do, though often with less availability than larger centres, but even smaller towns will often have a bar with occasional live music, a minor-league sports team, and/or a small museum somewhere. Rural areas span every climate from frozen tundra to scorching desert, and pleasant meadows to the Rocky Mountains. Trails, lakes, rivers, and outright wilderness are all fairly accessible, but the exact sort of landscape will vary immensely across the continent. Each country (or group of countries, in the case of the Caribbean) in North America has its own currency, though the US dollar is accepted nearly universally in Central America and the Caribbean. Travelers to Cuba and Canada, however, should invest in the local currency. Visa and MasterCard are almost universally accepted across the continent, other than at things like street vendors. Automatic banking machines are quite common, and can be used to withdraw cash in local currencies with a credit card, although this may result in significant fees (usually ~$3 per transaction, plus interest for a cash advance). Debit cards often work, though it is less reliable and still charges the per-transaction fee. American Express and Discover are secondary credit cards, available at many retailers(though by no means all). Many jurisdictions, though not all, charge sales taxes on purchases, which can be as high as 13%. This is not included in the price for most goods, so keep this in mind. In the US, sales taxes can vary by city in some places, so it may be impractical to keep exact percentages in mind, but locals will be able to answer easily if asked. North America's history of recent and significant immigration has led to an extremely varied set of options in cuisine, especially in the larger and more multicultural cities like New York or Toronto. Virtually every form of ethnic food is available in larger cities, though often in forms that will be somewhat alien to people actually from the country the cuisine is named after - Chinese food and pizza are particular offenders here, being forms of cuisine heavily adapted from the originals by Americans. Authentic cuisine is available in any area that has a large immigrant population of the relevant ancestry, but the American variety is much more commonly found. Many local forms of cuisine exist as well. Tex-mex cuisine is popular in the Southwestern US, and available across the continent(though Taco Bell, the most common such chain, is generally considered an exceptionally poor example of the form). Canada and some parts of the northern US offer poutine, which is fries covered in cheese curd and gravy. The southern US offers a wide range of specialities, though most are only available locally. It is customary to tip wait staff at certain restaurants. Generally, fast-food places do not require tipping, but it is generally expected at sit-down restaurants and bars. 15% is the usual amount, but it can be adjusted up and down based on to quality of service. Keep in mind that staff in tip-heavy industries usually get paid far less than minimum wage, because the expectation is that patrons will make up the difference with gratuities. Alcohol is somewhat less tolerated in North America than in many other parts of the world, particularly Europe. Drinking in public is almost universally illegal, with the exception of a few "party towns" (most notably, New Orleans and Las Vegas). The drinking age is 21 in the United States, 18-19 in Canada and 18 in Mexico, and it is generally enforced. This leads to the strange phenomena of adults often being seen drinking out of brown paper bag wrapped bottles. In some areas you can only buy alcohol from government-owned stores, which often have restricted hours and limited supply. Bars in most areas have enforced closing times, which can be as early as 02:00. Hotels are widely available across Canada and the US, in basically every town and even some villages. Expect to pay $60-100 per night for a reasonable chain hotel, but it will usually be clean, private, decently maintained, and often include amenities like free Wi-Fi, free breakfasts, and swimming pools(though none of those are universal, so check before booking). For the more budget-conscious traveller, hostels are reasonable choices in larger cities. Expect many fewer amenities, and frequently communal rooms, but prices are perhaps half of a hotel's. Other options include bed and breakfasts, most frequently in smaller and rural areas, and short-term rentals of houses or cottages. Details vary wildly, and there is not always availability in every area, so confirm before travelling if you plan to do this. Canada and the United States are generally safe, as long as you stay away from bad neighbourhoods (most of which will have little appeal to travelers, and will be obvious at a glance). Likewise, many (though not all) Caribbean islands are quite well-run and safe. Conversely, much of Central America has a significant problem with street crime, and you should investigate the local country articles for more details if you are travelling there. Tourist resorts are almost always quite safe, even in dangerous countries, but setting foot outside the resort tends to put you into much more typical parts of the country, so safety can decline quickly if you leave the tourist areas. Common-sense precautions are always wise even in nice areas, of course - don't show of wads of cash, keep an eye on your belongings, and the like. If you do encounter an emergency, calling 911 on any telephone, generally even a cell phone without a service provider, will connect you with an emergency dispatcher that can send police, fire, or ambulance crews. Most of the continent has high public health standards and relatively few issues with diseases. Medical care is commonly available and of a high standard. However, apart from Cuba, it can be extremely expensive for those who don't have travel insurance - the United States, in particular, has massively expensive medical services, and even a short hospital stay can cost tens of thousands of dollars. In a pinch, most countries require their medical facilities to treat emergencies first and worry about billing later. Some parts of Central America and the Caribbean are less well-provisioned in this regard, however - again, check the local country articles. Certain areas have issues with natural disasters that travellers should be aware of. Hurricanes in the Gulf of Mexico and the Atlantic coast happen in roughly June-November, and serious ones are frequently fatal for those caught on the coast, or on small Caribbean islands. The south-central United States is known as "tornado alley", and gets roughly half the tornadoes in the world. California and the Caribbean basin also get serious earthquakes on occasion. Northern areas, particularly the Northeast, get severe blizzards in roughly December-March, which do not generally cause fatalities, but can easily snarl travel for days. None of these disasters is particularly common or predictable, and as such they shouldn't impact travel plans too badly, but be aware of the possibility and the appropriate responses. This page was last edited on 10 March 2019, at 17:04.